Nalanda University, Seat of World’s Most Ancient International Residential University and an ancient religious center of learning, is in Bihar state of India. It was the world’s leading University from 5th century to 1197 A.D. and was ransacked and destroyed in 1193 by by a Turkish Muslim army. They also drove the monks away from the site and set the University library on fire. There are many ruined buildings at “Nalanda University Ruins Archaeological Complex”, which were part of the University, spread over 1.5 lacks square meters area, which attracts a lot of tourists. There is “Nalanda Archaeological Museum”, which is on the opposite side of the “Nalanda University Ruins Archaeological Complex site”. 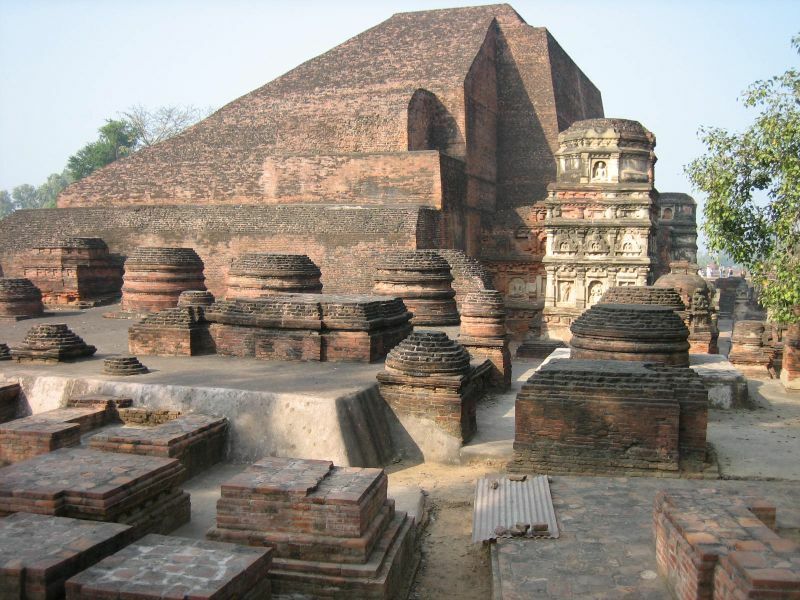 Another ancient University named “Tiladhaka University” was also found in Nalanda. Some of the other tourist places in the Ancient Seat of Learning are the following. “Nava Nalanda Mahavihara”, is a new study and research center at Nalanda, for Pali Literature and Buddhism. “Hieun Tsang Memorial Hall”, is a new hall in memory of the Great Ancient Chinese Traveler, Hieun Tsang (602–664), who visited Nalada on his trip to India and has written about the Ancient Seat of Learning in his book. ‘Gridhkuta hill top’, near Rajgir, used to be one of the favorite meditation site for Gautham Buddha. How Do I Go to Nalanda University? Rajgir railway station at 12 kilometers distance, is the nearest station to Nalanda. Gaya station is the most convenient railway station, which is connected to other major cities, at 95 kilometers away. Patna airport is the nearest airport to Nalanda University Ruins site, at around 90 kilometers distance. Bodh Gaya is at 110 kilometers distance from Nalanda. Cycle Rickshaws are the mode of local transport in Nalanda and there are no taxis available for local travel. Where can I Stay While on a Visit to Nalanda University? Rajgir, the famous Buddhist center, is the nearest convenient place to stay for a tourist to the city of Ancient Seat of Learning. Bihar State Tourism Development Corporations has three tourist Bungalows at Rajgir . There are other private hotels also.